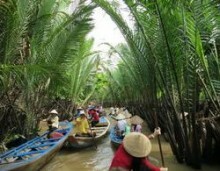 Vietnam Travel Consultant Team would like to welcome and serve you and your friends in our beautiful Vietnam. Ha Long Bay is a beautiful natural wonder in northern Vietnam near the Chinese border. The Bay is dotted with 1,600 limestone islands and islets and covers an area of over 1,500 km2. This extraordinary area was declared a UNESCO World Heritage Site in 1994. For many tourists, this place is like something right out of a movie. The fact is that Ha Long Bay features a wide range of biodiversity, while the surrealistic scenery has indeed featured in endless movies. The Bay is the accommodation of many fishing communities, including the 4 communes of Cua Van, Cong Tau, Vong Vieng and Ba Hang with a population of more than 1,600 people. The residents live on floating houses and boats, making their own lives by fishing and aquaculture. Free wifi access is available onboard, you have plenty of time socializing, chatting online. Enjoy sunrise over the bay or take part in a Tai Chi session on cruise sundeck. Relax with complimentary tea and coffee served. Have light breakfast on board. Check out your cabin. Photograph wonderful Ha Long while cruising through other parts. Our guide will come to pick up from the hotel lobby at 19:30 and transfer to Hanoi Railway Station to catch the train to Sapa. Passport with valid visa, insect repellent, swimming suits, cash. For the early risers, join us for a Tai Chi session on the sundeck. Tai chi helps our mind to focus and to full charge your energy for the day. Our private car and driver will transfer you to Vancouver Hotel at No. 01 - Lane 75 - Luong Van Tuy Street - Ninh Binh. Start your adventure by explore a historical Bai Tu Long with extraordinary limestone karst landscapes, Oan Lagoon, Teapot , Monster Head Islets, and the towns of Hon Gai and Cam Pha. Head to Vung Vieng fishing village by local rowing boats or kayaks to explore the interesting daily lives of its inhabitants. Your free time to relax with many interesting activities boat cruise such as watch movies, squid fishing, massage or simply relax on our roof top deck under the cover of a star filled sky. Tai Chi will be conducted again today on our upper deck and is a terrific way to feel as one with the peaceful surroundings. Get on shuttle mini bus and get back to Hanoi. 01 lunch, 01 dinner, 01 morning snack, 01 brunch.